Cutest Hello Kitty Bedroom for Girls! How to create the cutest Hello Kitty bedroom for girls! I can’t wait to show you how to create the most wonderful, cute and adorable Hello Kitty bedroom for your little girl!! I also LOVE Hello Kitty and she was one of my favorite characters when I was a little girl! Nowadays we can find a gorgeous selection of cute Hello Kitty decor stuff and furniture! My favorite is this gorgeous Hello Kitty bed you see on the picture! Isn’t it the most adorable thing you have ever seen? It all starts with a bed! 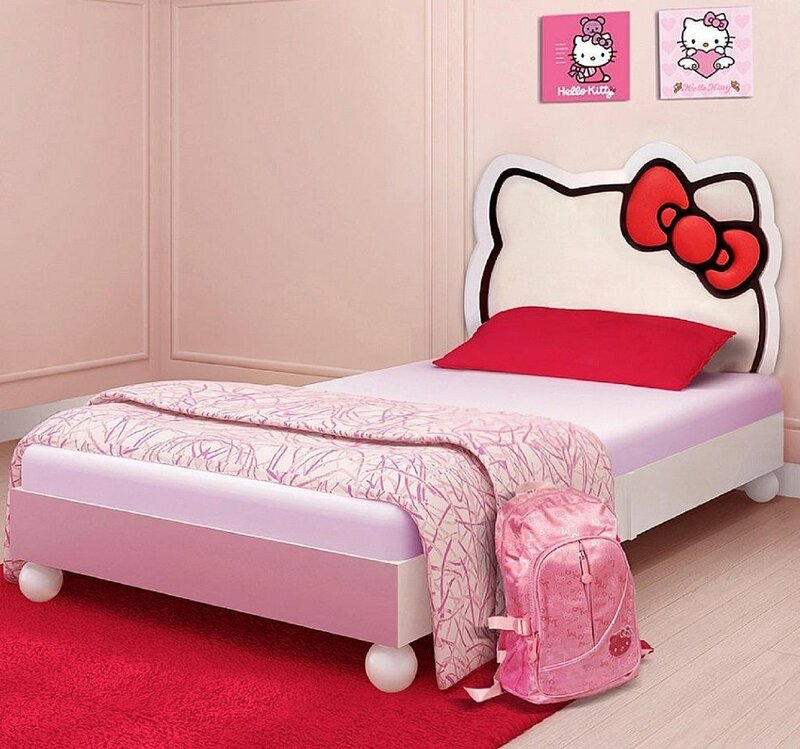 On this page you will find beautiful Hello Kitty dressers, rugs, chairs, comforter sets and other cute Hello Kitty bedroom decor stuff to create the most amazing bedroom for your little girl! 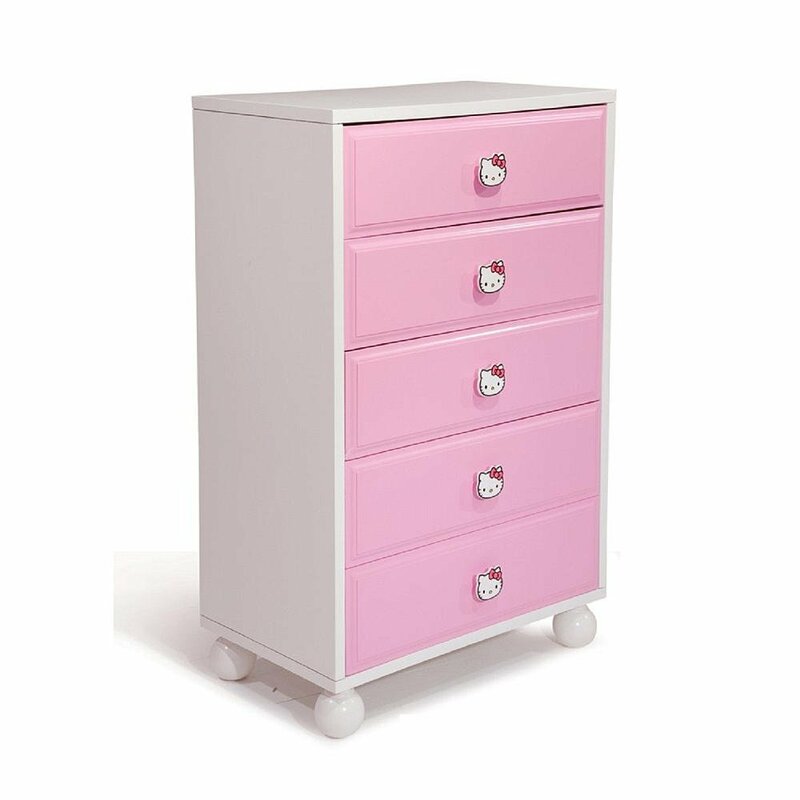 After you get the cute Hello Kitty bed, get a cute Hello Kitty dresser! Check out the cute Hello Kitty face handle knobs! This is one of the most beautiful Hello Kitty bedding sets I’ve seen! It is a 7-piece hot pink Hello Kitty queen comforter set for sale! It includes all the gorgeous pillow cases you see on the picture and the cute square pillow too! Perfect for a girly teenage girl’s bedroom! 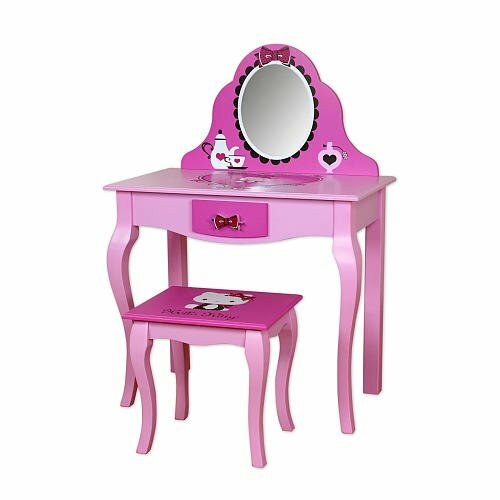 A very cute pink and purple Hello Kitty vanity set for girls! 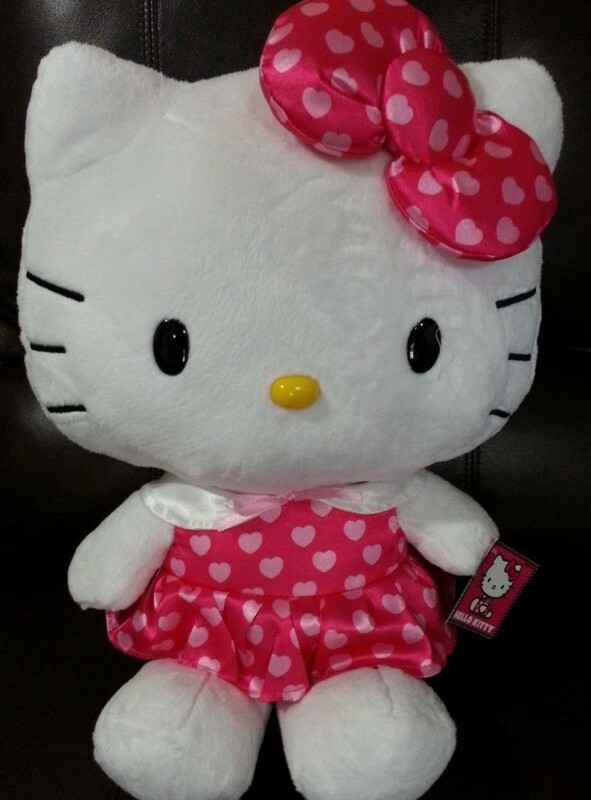 Another perfect addition to your little girl’s Hello Kitty bedroom! 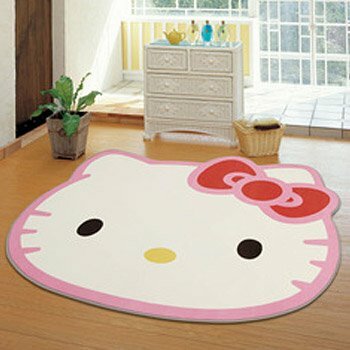 Another awesome Hello Kitty bedroom decor idea is obviously a cute Hello Kitty rug! Will be perfect to have next to the Hello Kitty bed and dresser! 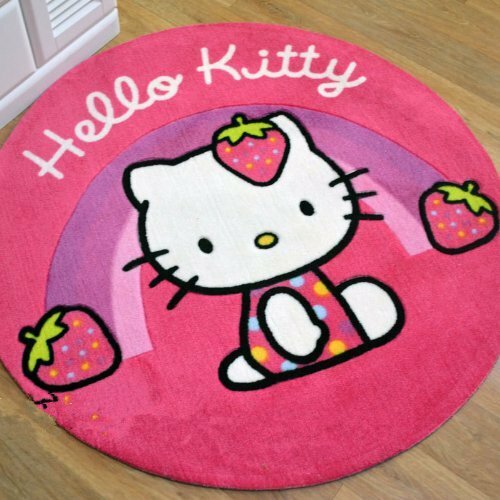 Another cute and adorable Hello Kitty rug for your little girl’s bedroom! I love the bright colors and the cute strawberries on her side! 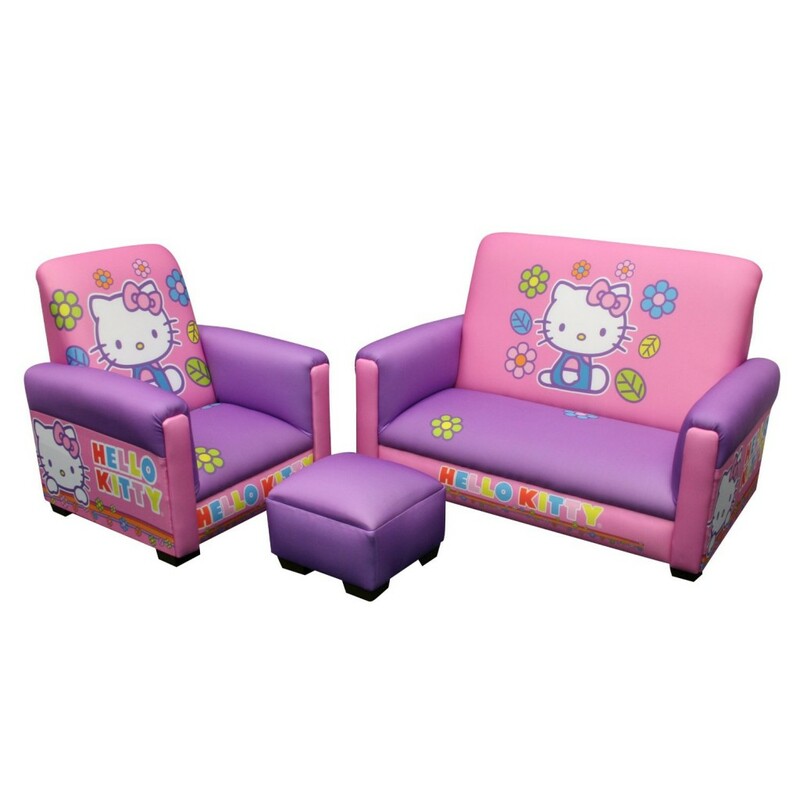 Adorable Hello Kitty Toddler Sofa Set! Best Hello Kitty Bedroom Ideas! Of course we can’t forget to add a cute Hello Kitty sofa set in your little girl’s Hello Kitty bedroom! This one is so colorful and ‘happy’!! I love the cute design! Perfect for a 1 or 2 year old little girl’s bedroom! 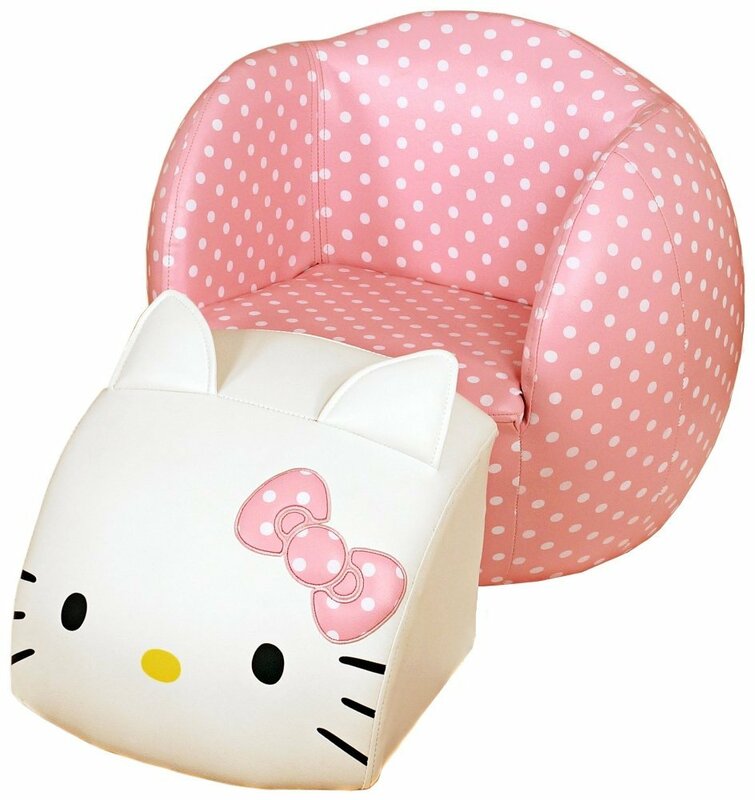 The Most FUN Hello Kitty Kids Chair and Ottoman! How adorable, fun and very unique is this Hello Kitty chair and ottoman set? When you her ‘face’ back in it will look like a giant Hello Kitty ball! I LOVE the cute pink color with the white polka dots! 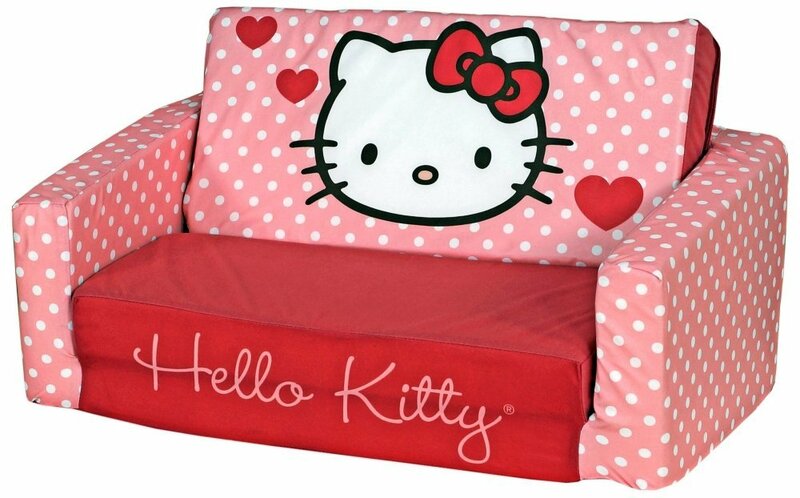 Another great idea for a Hello Kitty bedroom for girls is to add a cute Hello Kitty sleeper sofa! This one is ultra-cute, girly and romantic! Great to use when your girl has a friend sleeping over! 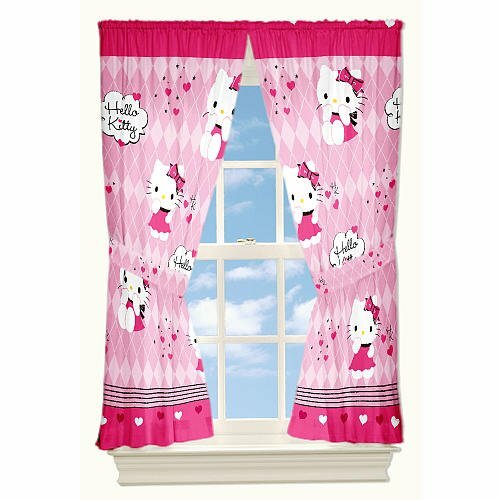 These Hello Kitty window drapes are very cute and very affordable! Great way to quickly transform your little girl’s bedroom! They are also super easy to wash! This has got to be the most unique Hello Kitty bedroom accessory ever! 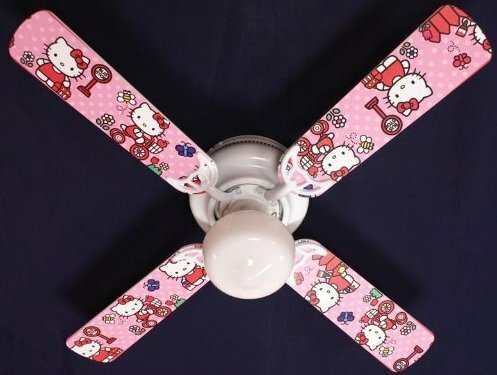 A Hello Kitty ceiling fan! Talk about keeping cool with Hello Kitty! Fun Hello Kitty Theme Bedroom for Girls! Don’t forget to also get a cute Hello Kitty lamp! Perfect to have next to the Hello Kitty bed, of course! This one is so adorable! It seems she is about to eat an apple! 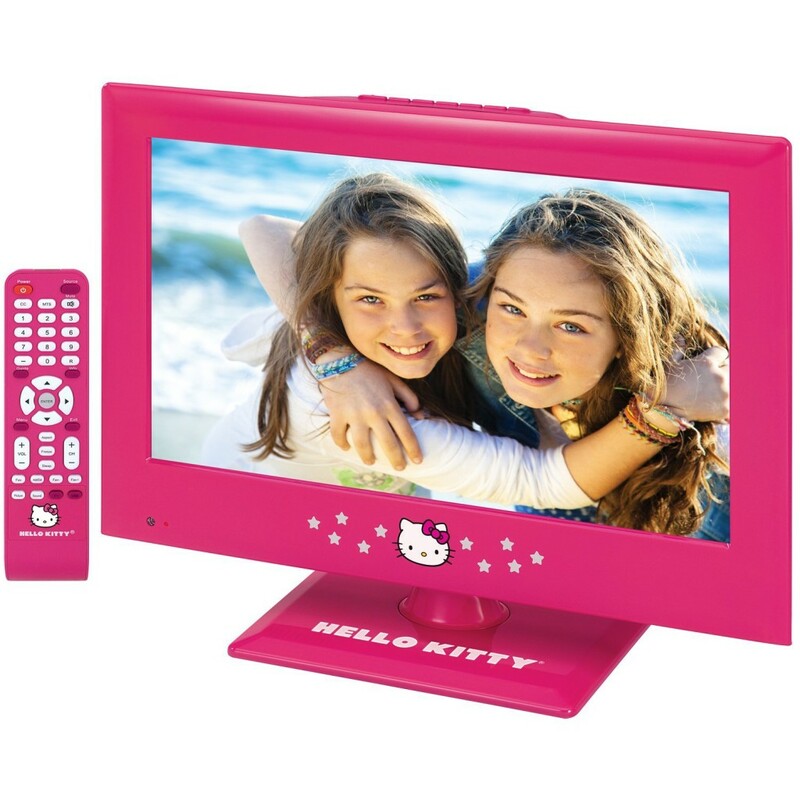 And last, but definitely not least, how about getting a pink Hello Kitty TV for your little girl’s bedroom too? Now her bedroom is complete! Can you imagine her face when she sees her brand-new Hello Kitty bedroom? 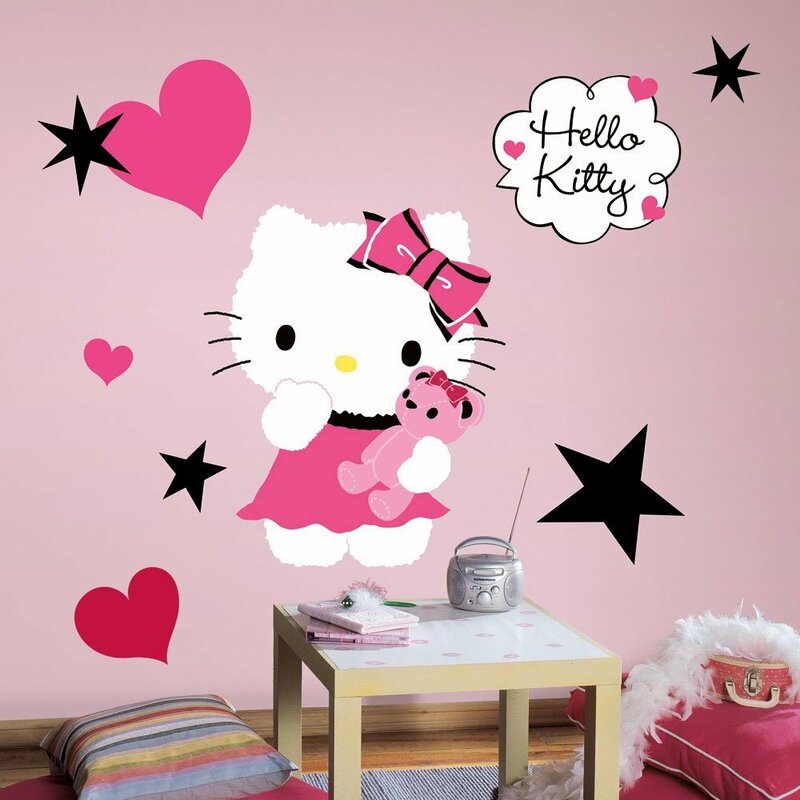 I almost forgot to show you this gorgeous Hello Kitty giant wall decal too! It’s a must-have to any Hello Kitty bedroom! Very easy and fun to apply! You will also get the fun stars and hearts! Very cheap, so you can get a few of them and apply all over your girl’s bedroom walls! I hope you were able to create the most amazing Hello Kitty bedroom for your daughter here today! Don’t forget to take lots of pictures and create some wonderful memories! One day she might want to do the same thing for her own daughter too!